City of Vancouver maps from 2016 show how ‘hot’ properties that inflated beyond the average are distributed across the city. They closely reflect the areas of the city that have undergone planning programs for increasing density and the resulting speculative inflation. The City of Vancouver passed reports at council last month to rezone across the city without public consultation. As this council’s failed decade of policy has shown, rezoning inflates land values, which is at the root of the affordability problem. Proposed actions to be considered in July will just make this worse as it further increases the affordability crisis they claim to be resolving. With only three business days to respond, the public got their first look at 680 pages of major policy documents proposed for approval. This posed a challenge for even the most dedicated policy wonks and impossible for the public on such short notice. 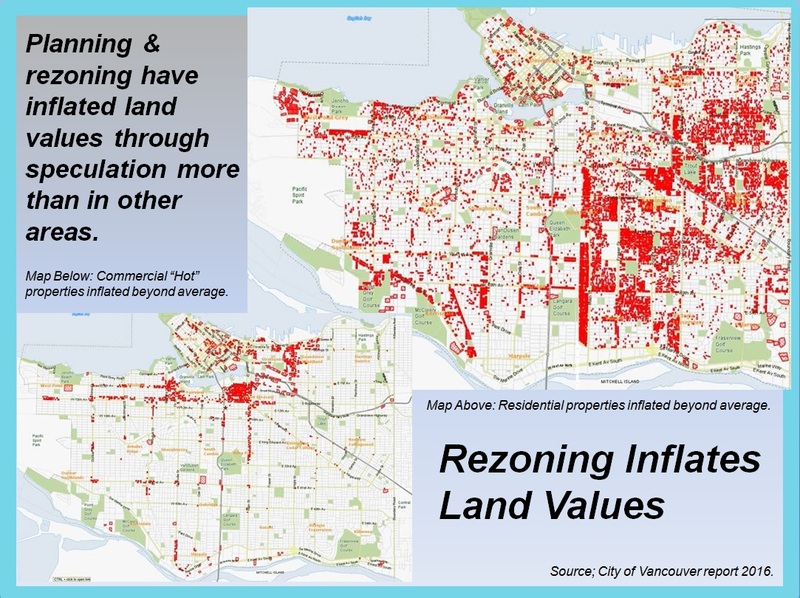 These included rezoning across the city in all RS (detached) and RT (duplex/infill) zones to multi-family under the Housing Vancouver strategy and Making Room reports, as well as a planning program for the Broadway corridor. Although most of this council aren’t running for re-election in October, the first referrals to public hearing were approved for July 18, followed by major reports for July 25. They seem determined to ruin what is left of this city as they run for the exits with most of the rats jumping ship. Current policy programs have resulted in massive land-value inflation. City of Vancouver maps from 2016 show how “hot” properties that inflated beyond the average are distributed across the city. They closely reflect the areas of the city that have undergone planning programs for increasing density and the resulting speculative inflation. Land inflation is clearly concentrated in the Cambie corridor, east side, downtown peninsula and the Broadway corridor. These are all areas where significant new density has been signalled by the city. Rezoning has been central to the rise in real estate prices that fuels the affordability crisis. The older, more-affordable stock is demolished to be replaced by much more expensive new development, both for ownership or rental. Foreign capital has further escalated this cycle. This has suited the development industry that controls council and will continue to do so as gaping loopholes for third-party campaign funding still remain. The province hasn’t removed big money from civic elections, just made it even darker and less accountable than it was before. Funding from developers flows into third-parties like Generation Squeeze that promotes rezoning and B.C. surtaxes benefiting industry while undermining affordability for everyone, including the millennials they claim to represent. The city knows that they have been approving new housing supply at record rates beyond the growth in population. This has been reflected in census data and the Regional Growth Strategy. It has been further confirmed by the city’s consultants and director of planning that the existing zoned capacity is well beyond what is required to meet the city’s anticipated growth for 2040 and beyond. The city concedes that it isn’t about adding more market housing, but about adding more of the “right” supply that needs to be more affordable. But the proposed measures will not achieve this for a number of reasons. First, let’s look at the Broadway corridor planning program. It includes the area from Clark Drive to Vine Street, two blocks west of Arbutus Street and 16th Avenue to First Avenue. The city tries to limit land speculation by showing industry how much it intends to take for significant public benefits. But this is typical of what the city did on the Cambie corridor by taking 75 per cent of land from rezoning, yet we all know how that turned out. And as you can see from the 2016 maps, the horses have left the barn on the Broadway corridor, with significant land speculation and inflation already in play all along the corridor to the University of B.C. But the city is putting on quite the show to make it look like they’re doing something different. In reality, they’re still putting a big bull’s eye around every station to show developers where to aim. Having most of the public-transit funding for the next generation in one, expensive, five-kilometre subway corridor means the rest of the city and region will be starved of transit infrastructure. This is mainly to subsidize the developers who will benefit in this scheme. A more affordable and sustainable option would be to expand an improved transit network throughout the arterial grid with electric trolleys and trams at a fraction of the cost of the short subway to nowhere. The City of Vancouver was originally designed as a streetcar city so everywhere is within a 10-minute walk to an arterial. We don’t have to substantially rebuild the city to be transit oriented. Just bring the transit to the people. To illustrate, a victim of current practice is Matias, who immigrated from Argentina 17 years ago. As an Industrious young man, he rented on the east side near the 29th Avenue SkyTrain Station and started his own small business, doing truck deliveries that also provided employment for others. But as the planning program to rezone the area took hold, development pressure forced up rents, eventually pricing him out of his modest, main-floor rental suite in 2015. As he explained his situation, I was expecting him to say how he was forced out of the city to New Westminster or something like that. But, no, he discovered the low-rent, older-apartment districts on the west side, such as Kerrisdale. There he found a large, older apartment for much less than what he was paying on the east side, where planning and rezoning were driving speculation and displacement. Except, of course, for the monster-house invasion, he said he was finding affordable pockets in other west-side neighbourhoods such as Kitsilano, West Point Grey and Dunbar that had older, character, more-affordable rental suites. Demolition of our character neighbourhoods will escalate with proposed policies to rezone the entire city, both east side and west side, again inflating land values. There has been no public involvement, only industry and insiders. The reports recommend moving away from neighbourhood-based planning to city-wide zoning without nuance of place. Directions include gutted design guidelines and reduced or eliminated on-site parking requirements, with permit parking expanded citywide. Kitsilano’s RT7-RT8 is proposed to add even further infill units on small lots to an already-dense, multiple-units-per-site area. All RS detached zoning is to become outright strata duplexes, with larger laneway houses that will not be affordable. All will be yet more incentives for demolition of character houses. Then at the last minute, after all speakers and questions to staff, Mayor Gregor Robertson adds a motion to include multiplexes — triplexes, fourplexes and more — to all RS and RT zones citywide. The public has no idea what that would look like until July 25, when staff are to come back with referral to public hearing for the whole program of rezoning across the city. No consultation of neighbourhoods, just a mad rush to rezone before the election. 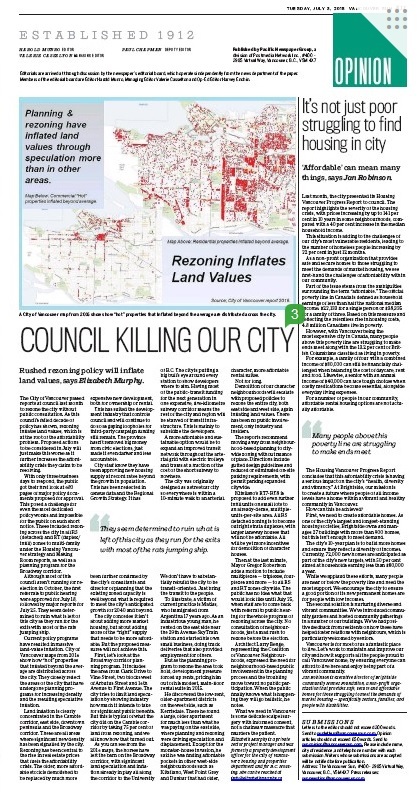 Designer Larry Benge, representing the Coalition of Vancouver Neighbourhoods, gallantly spoke to council on all the reports spread over early morning to late that night. He expressed the need for neighbourhood-based public involvement in the planning process and the troubling move toward no public participation. When the public finally knows what is happening they will go ballistic, he notes. What we need in Vancouver is some delicate scalpel surgery with informed consent, not a chainsaw massacre that murders the patient. Copyright Elizabeth Murphy 2018 all rights reserved. 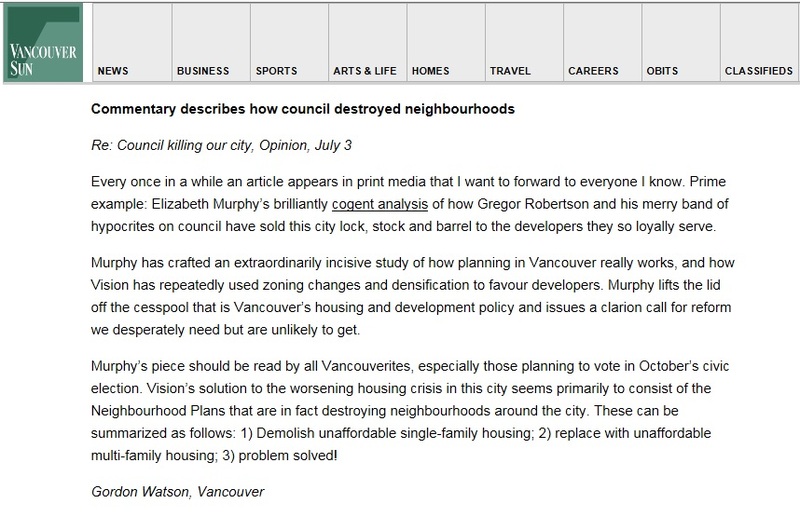 This entry was posted in Elizabeth Murphy, Vancouver Sun and tagged Affordable Housing, Community Plans, Elizabeth Murphy, property taxes, Vancouver. Bookmark the permalink. They have destroyed our city, no consultation. Thanks for your hard work, Elizabeth.